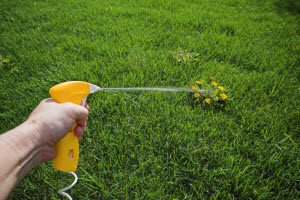 Weed control companies often get a bad rap, or they slip completely off your radar. Is that really what you want in a service partner? When troubles arise, you need to work with someone capable of discussing your concerns. By working together, you will find affordable solutions. You’ll get a fast, accurate free estimate. When was the last time you scheduled an appointment with a service company and had someone show up right away? Too many weed control companies will make you wait weeks to speak with someone in person. This is intended to give you the impression that they’re very busy, as if their time is too valuable for giving out free quotes. It makes you sweat and encourages you to skip the estimate and jump straight to scheduling a service call. Don’t fall for the ploy. Despite having a robust list of clients at Think Green, we’ll still visit your property within a reasonable time period and give you a heads up on the cost of insect-, weed- and disease-free landscaping. You’ll wind up with a beautiful lawn. After 30 years in the business, we created a company capable of delivering the lush look homeowners were after without the flood of chemicals many companies employ. Our aim is on health. We root out the problems affecting your grass and offer you permanent solutions. For instance, adding lime to create the soil needed to support a healthy lawn provides lasting benefits. It allows for the use of eco-friendly pesticides over the exceptionally harsh applications other weed control companies use on your property. In short, we’ll help you feel satisfied without putting you or your family at risk. You’ll enjoy your property more and use it for more of year. Think Green provides a few additional services, such as lawn pest management, so you can host summer get-togethers or even just play in the yard without being bothered by bugs. 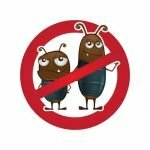 Mosquitos, fire ants, fleas, earwigs, spiders and ticks are just a few of the pests you may find in your grass. 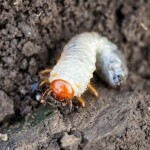 We also work against pests, like grubs, that attack your grass. You’ll receive special pricing just for being a loyal customer of one of Atlanta’s best weed control companies! When we started out to create something different for Atlanta residents, we knew we weren’t alone. Your continued support makes the biggest impact on our business. We show appreciation for both new and loyal customers throughout the year with special pricing on everything from lawn aeration to fire ant control. Even the best weed control companies need customers in order to make a difference. Make the first move. Pick up the phone and call (678) 648-2556 to schedule service today with the best of the best in weed control companies.